Great post! Simple and to the point. I’m going to print this off and keep it with me in case I need to check when I go shopping next. Been waiting for a post like this. Thank you! Great post! Question on the vents: I myself tend to go for the center vent because it seems (to me) a little more streamlined, especially with a more modern fitting, tailored suit. Yet I have friends who swear by side vents. Is one more preferable, or totally just up to the wearer’s physique? Awesome post here gents, was totally needed! Awesome post!! My first suit was charcoal but I’m thinking now navy should be the next one I purchase, or would gray be more versatile? I needed this nine months ago when I bought my first suit. Flat front pants are still pleated in the legs, just not in the thigh. Not sure if the picture shows that very well. This concept confused the crap out of me for the longest time haha. @James: I think a reason for choosing side vents is that they’re less restrictive when moving. I read people saying it helps when sitting, but I found it most beneficial when putting my hand in my pocket. I like this article alot. I have the same ideas in mind and now I know how to buy and find the best suit now. That V shape in the suit is the most powerful part of the suit. You gotta have that V and it should be outstanding. For me, it makes the suit. And the pant leg should drape over the shoe. From top to bottom, the suit should be impeccable. Really? Grey & blue are ‘starred’ over the classic black? I thought black is/was and always will be the bees-knees and a colour to fall back on for almost every occasion? Lemme know if you disagree and why? I’d be curious to know a different opinion. After reading countless articles to find the best suit options I have never seen a recommendation made for a black suit unless you work in retail or are going to a funeral. @Bukedy – Thanks for your comment. This is unfortunately a common question and in my years of being in the menswear industry I’m still searching for where this comes from. Black is only considered classic and the color of choice for formal events and fro social affairs after 6pm. 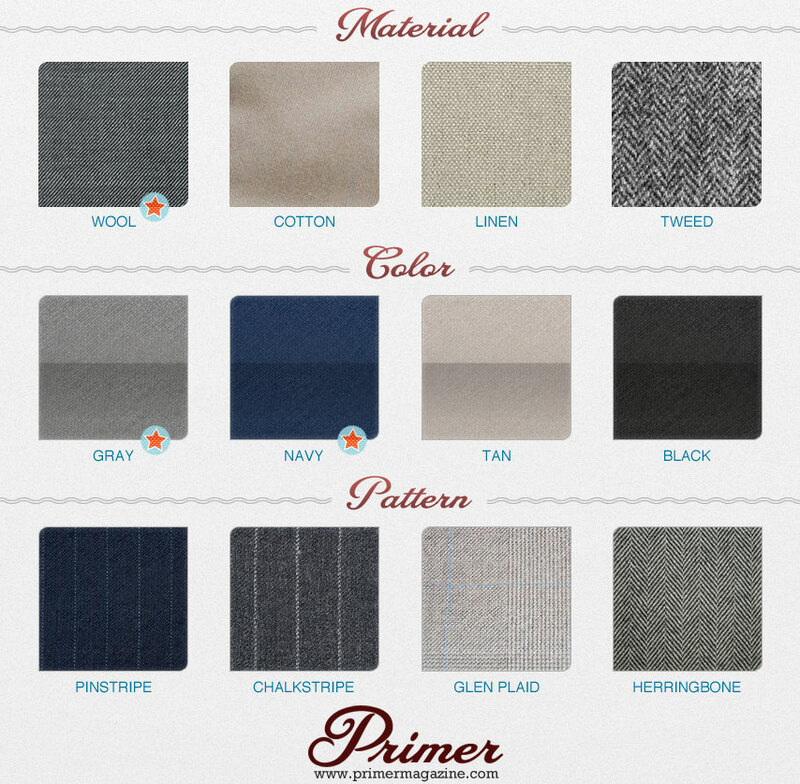 Navy and gray are much more versatile for business and leisure. Black is harsh against many skin tones, has no life, and can take on a green tinge under artificial light. Black of course is the first choice for tuxedos and the like, but it is no wonder why the most formal attire are white tails and the gray morning coat comes in a close second. Midnight blue is actually looks better under natural and artificial light and is an overwhelmingly more stylish option. It is a common misconception that black is the end all, be all go-to color. it is not as slimming as people think, it fades easily and can take on a sheen after too many washings and/or dry cleaning’s. Navy and gray are indeed better choices overall. Something I always wondered : Why do they make jackets with low armholes ? What’s the point of these ? It has to do with who they’re making the suit for. Off the rack suits, especially cheaper ones, are made in an attempt to fit as many people as possible, lower armholes can accomodate more sizes. This is why I love Primer. Awesome visual guide! 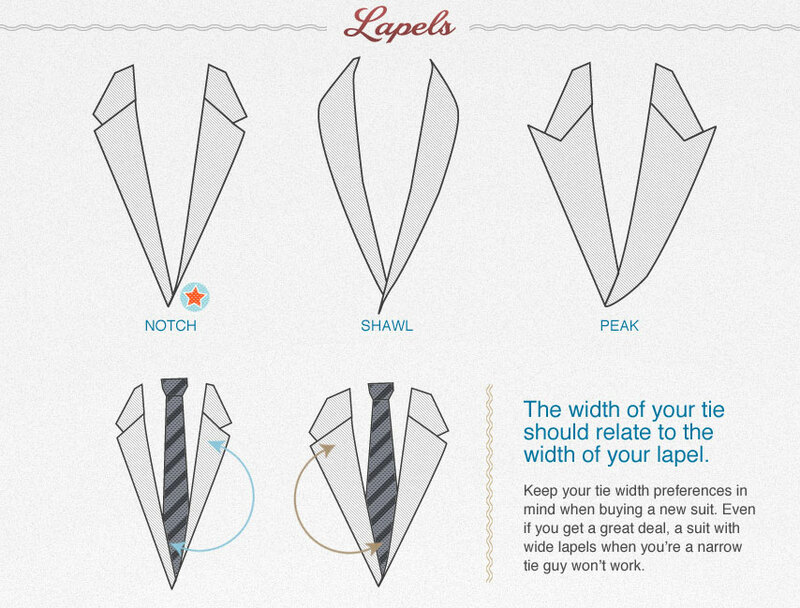 To all the shorter guys, watch that button stance and make sure opt for slim lapels (unless you’re stout…then thin lapels will make you look wider). Outstanding article Andrew, thanks a lot. I’ll be buying my first suit in the next few weeks before I move to a big city (recent grad), this helps a lot. Where is charcoal in the colour list? I think that a charcoal would be far preferable to a grey suit. I am a “more mature” woman and was very pleased to see this post…on my Grandson’s page….glad to see there is an interest in presenting a more business like appearance among the young men of today. Many of the guidelines I was aware of and a few that I wasn’t. I would have liked to see the addition of the lower pant finish ie: cuff/no cuff and break. Also the sleeve length in relationship to shirt sleeve. I realize this guide is directed to ready wear but some alterations may be included in the purchase. Let me add to everyone’s complements. This is some great information and I’m glad that we at 7 Regent Lane had a small hand in helping get it out. I wanted to let you know that if anyone is in the market for a suit, 7RL is conducting a Kickstarter campaign to expand our products. In return for support we have some great offers on our products. Please check it out if your’e so inclined. Thank you so much for sharing this information. I am always looking to grasp more knowledge on style, versality and product information. This buildts my confidence and I’m well prepared for my customer. Please share more post like this one. If the fifth button of the vest “should always remain undone” what is the point of having that fifth button? Great article. The one thing that was missing is cuffs vs. no cuffs on the pants. Cuffs are classic but they may not be for everybody. I don’t own a suit, but at least now I know what to look for! Pants should be cuffed if they are pleated. Not cuffed if they are flat front. Great article! 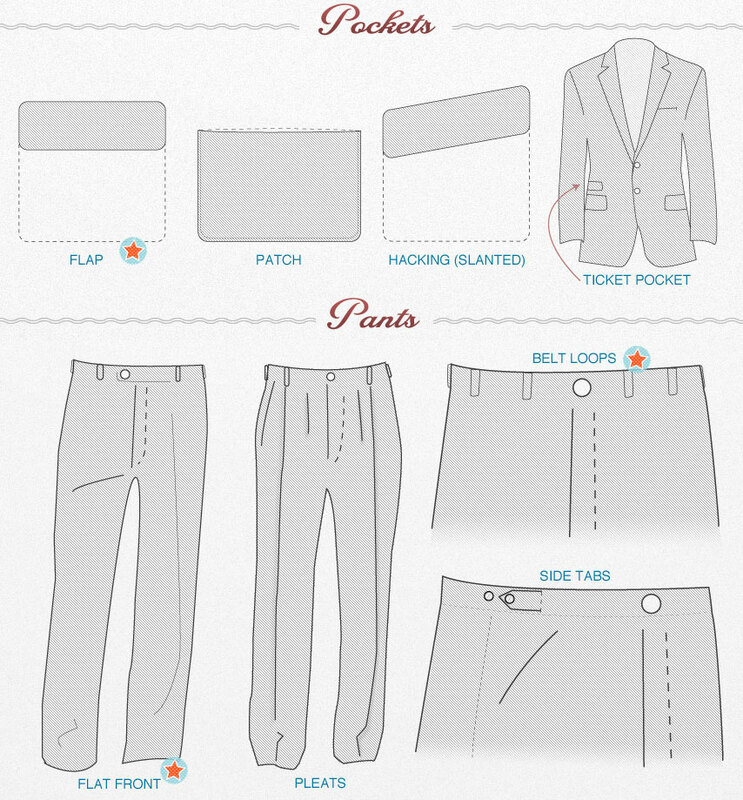 We didn’t know there were so many different ways a suit can be put together, plus some great simple illustrations. Definitely looking here first before I go buy my next suit. are double breasted sport jackets fashionable now? Dang this is a great post! Something I always wondered : Why do they make jackets with low armholes ? What’s the point of these ?! 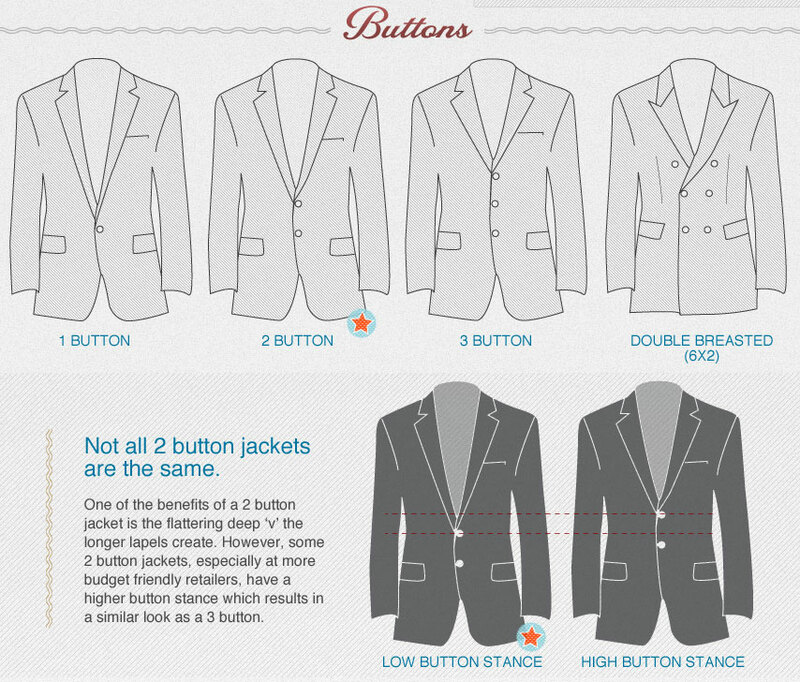 This is guide is just impressive, especially for beginners who are looking for a tips to wear the suit the first or second time. 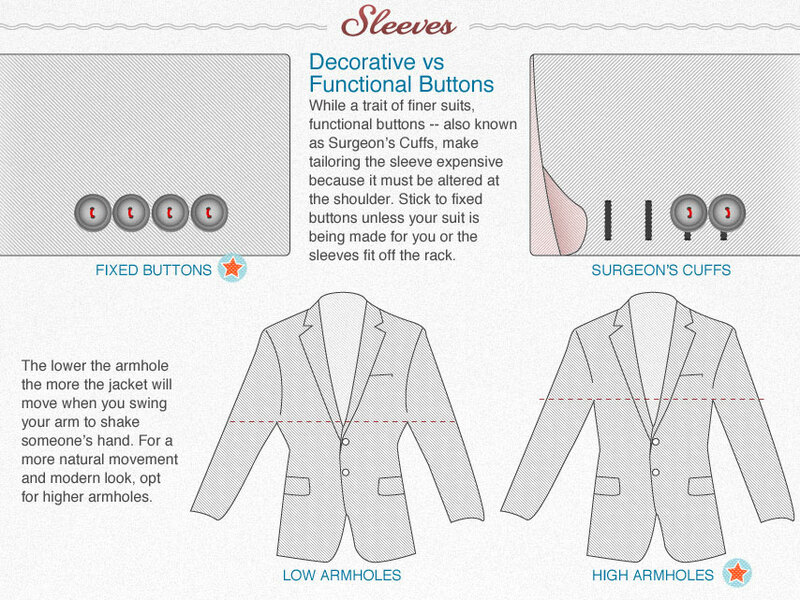 This guide would be even good if you could have mentioned bit tips for double breasted suits! Thanks for sharing it with us. Certainly one of the best visual guides I have seen ever, great for any suit beginner, this guide could be even more fantastic if you can highligh about the trouser’s breaks, and jacket cuffs including gauntlet, and working! Guys, pull down the back of the suit jacket when you sit down so it doesn’t hoist up around the neck. Also, no pleats! Didn’t we have enough ugly pleated pants during the 80s?